I’ve mentioned already this month that we are on a very tight grocery budget so I’m making the most of it by using what I already have. So, I was rummaging through my freezer – and for this meal I only needed to be 1 can of cream of chicken soup. How effecient is that? I love comfort food. My mister finds that strange. Do you love comfort food? I’m talking about mostly foods that you can eat with a spoon: my Granny’s chicken and rice, pie, ice cream, macaroni and cheese, cereal, mashed potatoes, guacamole. The list could go on. My mister knows that I have a relationship with food because I’ll sit down on the couch with a big bowl in my hand and sometimes sigh as I dig into my favorite dessert or pasta goodness (I don’t do that as often but the relationship still exists. 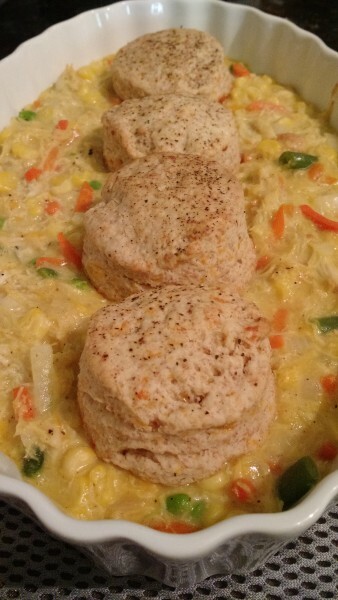 The biscuits I used were leftover from a 4th of July cookout I went to. I just saved some of the biscuits in the freezer and used them here. Saute your onions in the butter. Add the mixed vegetables and cook until thawed. Bake for 15 minutes or until biscuits are warmed. So, if you need a quick comfort food meal to put on the table in less than 30 minutes, here is one for you.